lawful booty. Kill! As you storm forward. Kill! You gallant soldiers of the Red army." the hight of their exodus. universities and the old shipping quarter were entirely destroyed. prisoners were also taken, almost none of whom were never heard from again. sent to Soviet gulags. In February of 1948, the Ministerial Council of the USSR decided to "resettle"
German cities and towns were neglected or demolished and the place names all changed. drug infested, filthy and stinking, and it has one of the world's highest rate of AIDS. obliterated. Russia even claims the great German philosopher Kant as "one of their own". importing food and supplies from Russia prohibitively expensive. million are in the "oblast" but not those people who bravely settled the land hundreds of years ago. or burning alive of millions of women and children non-combatants in wartime. also murdered by the Red Army in Metgethen, East Prussia, another plaec of slaughter. the endangered East Prussians was to flee, and they would face uncounted scenes of terror. between eight and eighty was violently raped, most multiple times and many were killed after. into holes in the ice and plunged into the unforgiving sea. on fire by hopeless owners who then committed suicide. 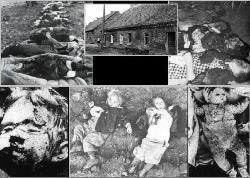 least 120,000 German civilians were either shot or beaten to death by the Red Army. across the Baltic Sea to Germany and occupied Denmark. But not all rescues were successful. them women and children who had reached the safety of the ship after grueling personal ordeals. wounded soldiers and another 1,000 refugees. Soviet submarine, and more than 6,000 non-combatant refugees fleeing from East Prussia also died. 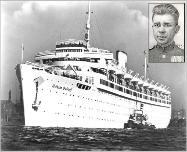 Below: Wm.Gustloff; Marinesko (click). There is a monument glorifying him in 'Kalingrad'.